Google is promoting legal movie services to people who search using piracy related keywords such as torrent, BitTorrent, DVDrip and Putlocker. 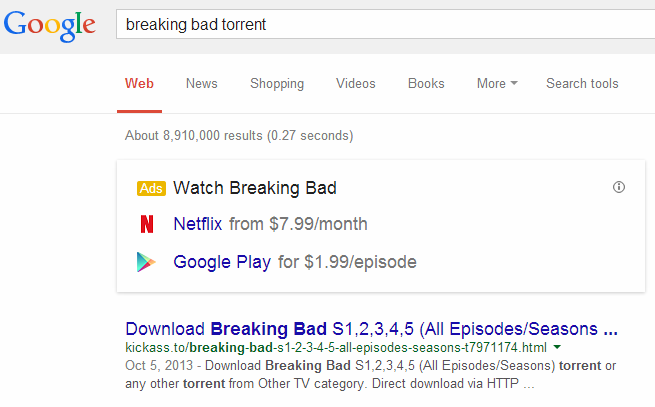 In what appears to be a bid to steer pirates on a straight course, prominent ad banners are placed above search results, pointing people to Google Play, Netflix, Hulu and other video platforms. Over the past few years the entertainment industries have repeatedly asked Google to step up its anti-piracy efforts. One of the most often heard complaints is that pirated content sometimes ranks better than legal alternatives. Copyright holders want Google to remedy this situation by promoting legal content through higher placement in search results. “Search engines should address the distortive search practices that result in listings and rankings that favor substantially infringing sites,” the MPAA complained earlier. While it seemed that Google had rejected the boosting of legal offerings in results, it appears that the company is now taking measures to address copyright holder concerns. As shown below, the first organic result is still a “pirate” site, but the legal options are now clearly visible through the inserted banner. Initially these new ads were displayed in most of the US and UK. The availability was limited after TorrentFreak reached out to Google before the weekend, but they are still visible to us from a California IP-address. 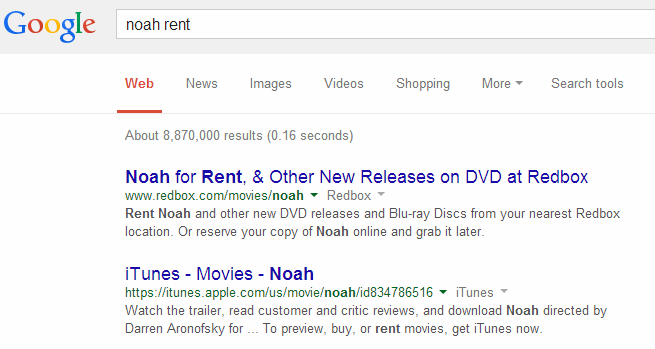 It’s unknown how Google picks the keywords but the banner is also shown when searching for the video format “avi” and even “putlocker,” a popular file-hosting service. The ads do not appear when searching for the movie or TV-show titles alone. They are specifically triggered by the extra ‘piracy’ keyword. 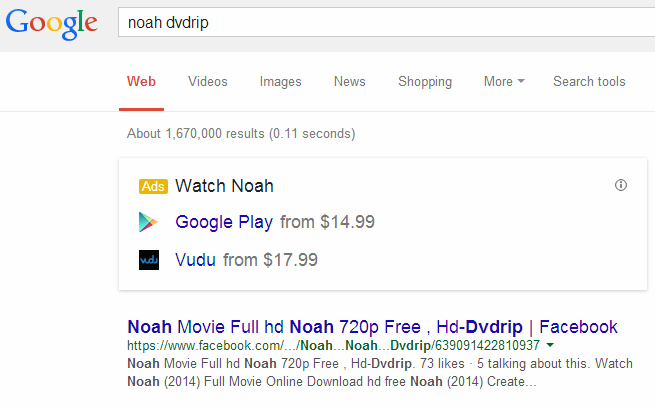 For example, the banner shows up when searching for “Noah DVDrip” but not for “Noah DVD,” “Noah rent“, “Noah buy” or Noah paired with a random word. In addition to piracy related keywords the ads also appear for more generic searches where pirate sites traditionally rank very high. These include words such as “download,” “watch,” “online” and “view” which often have unauthorized sites in the top results. 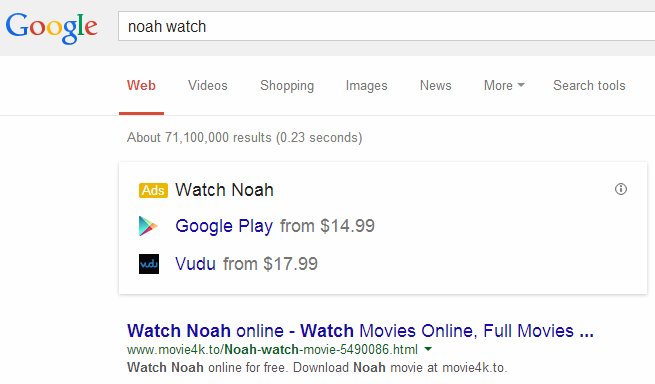 The “Noah watch” search below is a good example where a banner is placed above the first result, which in this case links to infringing material. 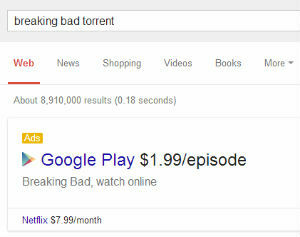 TorrentFreak contacted Google but the company couldn’t say why the ads are displayed for these piracy related keywords. A spokesman did confirm that the ads appear for “various searches” and that they are the same format as the Knowledge Graph ads that were rolled out late last year. “These ads will appear after various searches that include specific movie, TV, and music titles,” a Google spokesman told us. Since the availability of the banners was limited overnight the company may still be experimenting with the setup. Unfortunately, Google couldn’t comment further on our findings. Promoting legal content through ads would make sense for Google, as that would satisfy some of the copyright holders’ demands without changing the actual search results. On top of that, it can be quite useful to users as well. Whether the banners will be able to steer people away from pirate sites has yet to be seen though.